They say it’s good to talk . . . and that’s certainly the way Panthers promoter Ged Rathbone thinks. The seething supremo reacted to his side’s home Sunday horror show – when they slumped to a miserable 53-37 defeat at the hands of Somerset at the East of England Showground – by picking up the phone. Rathbone made calls to all seven of his riders the day after the night of their first Premier League loss of the season, but it was an exercise in cool reflection rather than far-reaching ultimatums. He said: “I spent pretty much all of Monday on the phone. I made my first call at around 9am and I didn’t finish speaking to the final rider until approximately 5.30pm. “I’m not the sort of person to over-react after a bad meeting, but as I always say, these are professional sportsmen and I could not just let the performance on Sunday pass. “To be beaten at home is always a huge disappointment, but for it to happen in the manner it did against Somerset is completely unacceptable. “It is not something that we can allow to happen again and all the riders are aware of what is required from them – individually and collectively. “We will work with riders to overcome any problems they may have and it was very encouraging to hear that some had already taken steps to make changes before speaking to me. “We’ve seen some glimpses of what this team is capable of when riding well, but we’ve also seen what can happen when we under-perform. Panthers will attempt to respond in the right way when travelling to big-spending Glasgow on Sunday (3pm). Rathbone may be forced to step in as team manager for the trip to Scotland as the club are yet to confirm a permanent successor to Carl Johnson, who stepped down a couple of weeks ago. Dale Allitt, who worked alongside Johnson last season, was in temporary charge for the last four meetings, but he has ample commitments at King’s Lynn where he is a promoter. Rathbone added: “We have given the team manager situation a lot of thought and will continue to do so over the coming days. “It is essential we arrive at the correct decision and we are throwing a few names around between ourselves. “I would love Dale to stay on, but we have to appreciate the big commitments he already has in place at King’s Lynn. “Their promoter, Buster Chapman, kindly agreed to allow Dale to look after our last four meetings. We would have to discuss any sort of extension to that with him. “I’ll step in as team manager at Glasgow if necessary and I feel it is a track where we could potentially pick up a result. “We’ve already done very well on the road this season and we’ll go there with the minimum target of getting a point. The trip to Ashfield provides a reunion for Panthers with the excellent Ben Barker, who starred for them in the final weeks of last season. The city club had hoped to persuade the Cornish charger to stay for 2016, but couldn’t compete with the package on offer from Glasgow, who have already reached the League Cup semi-finals and won their only league meeting to date – a 51-39 success against Redcar last Sunday. 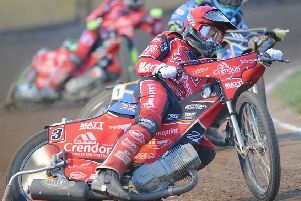 Barker is part of a powerful main body of the Scottish side which also includes Richard Lawson, Aaron Summers and Richie Worrall, although the latter missed both their meetings last weekend due to injury.